Yesterday I spent most of the day driving, Malvern is a bit of a trek for us but it sure beats posting the quilt a second time and as it turned out I needed to go and collect a pot, but more on that in a minute. Tet spotted this pair of quilts for me. They were the most exciting thing there as far as I was concerned. I'm not even talking about the show allowing multi part entries, though that is quite interesting to note. These were started in a workshop I taught, and here they are finished and in a show. That is pretty amazing. I don't often get to see student finished pieces at all so these are very special. I hope lots of visitors enjoyed them too. Those of you familiar with Ricky Tims work will know that these are his caveman quilting technique. It's a very fun way to make quilts with a lot of potential for other projects, but right now the cool part is it's Ricky's technique. I only put in one quilt for this show because I wanted my other new quilts to go to the National Quilt Championships. Dragon 1 did me proud, winning first place in the large wall hanging category. 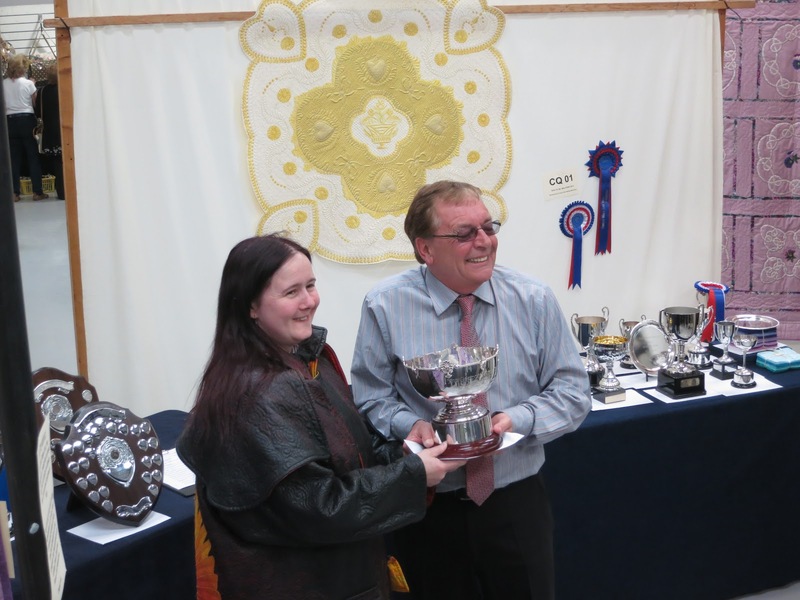 For this I was awarded this trophy which seemed determined to cause trouble. Firstly it hid when it was due to be presented. Then we discovered it was in two pieces. Both pieces are quite awkward and we were sure we were going to drop it. Now we get to the fun bit, Ricky Tims won this award in 1997. How cool is that? 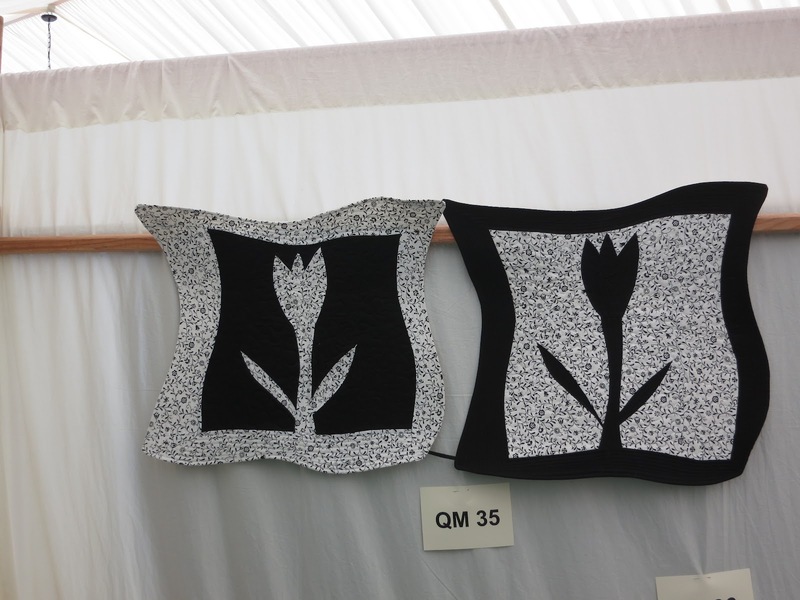 I would love to know which of his quilts it was and what prompted him to enter a UK quilt show. That being said, there are more overseas entries a couple of the awards will be heading to Germany. It's good to see more quilters showing here. It is expensive to ship quilts around the world but it is really appreciated by those of us who can't afford to travel much ourselves. The other bit of very exciting news will just have to wait until tomorrow. I've got a mad busy week and I need to get to bed. Congratulations Ferret! Your work is so amazing! I was really happy to see it when I went on Thursday having watched it being born on your blog. Congratulations. I had to get back to the stand as Glyn was fending off the hordes on his own LOL so I didn't know about the pot being in 2 pieces - oops! So cool that Ricky won it in 1997. When I get to sift through my old photos of the show, it's quite likely I've got a photo of it. 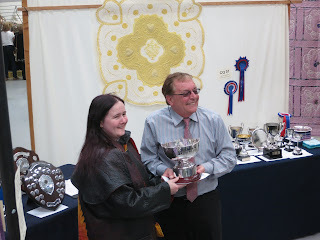 It was the first Quilts UK I attended and I took loads of photos - all prints of course. I will still have the showguide too somewhere, as I always keep them. Will scan the pic for you when I find it. 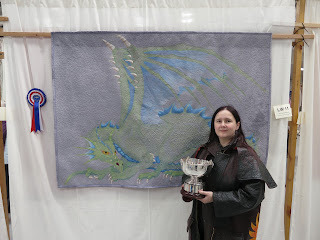 Great that Dragon 1 won! Congratulations! It's really lovely and a well deserved win. 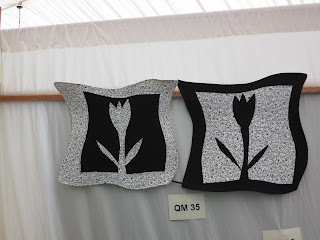 I love the fact that people who see my quilts in progress get a buzz when they do well in shows. I've noticed it before when I have worked on show quilts in classes those students have all adopted those quilts. It's great that the blog can spread that feeling around more. If you can find a picture Susan that would be great. I guess I should try asking the man himself, though I bet he doesn't know off the top of his head.